Hello Friends! We have made it to another weekend. That always sounds so nice to me. But I often find my weekends just as hectic as the weekdays...just busy doing other stuff. Anyhow, thanks so much for stopping by. Please remember that I am an AMATEUR investor, that you should do your OWN research on all stocks on this website and discuss with a PROFESSIONAL investment advisor before taking any action based on information here! As 'regulars' who visit here know, I have started using the weekend to try to look back on past picks on this blog....and see how they turned out. That way, we can figure out if what I am doing here ACTUALLY works (lol)...and which of the picks were successful. This, hopefully, will help me pick stocks better in the future! During the week of June 9, 2003, I selected nine stocks for review. On June 9, 2003, I selected Accredited Home Lenders (LEND) for this blog at a price of $19.58. LEND closed on 6/18/04 at $28.69 for a gain of $9.11 or 46.5%. On April 29, 2004, LEND reported 1st quarter 2004 results. Total revenues increased 50% to $119.0 million from $79.1 million the prior year and net income was $22.5 million or $1.05/diluted share for the quarter ended March 31, 2004, an increase of 52% over net income of $14.8 million for the prior year or $.85/diluted share for 2003. These are nice results! On June 10, 2003, I posted Pediatrix (PDX) on Stock Picks Bob's Advice at a price of $38.80. PDX closed at $67.70 on 6/18/04 for a gain of $28.90 or 74.5%. On May 4, 2004, PDX reported 1st quarter 2004 results. Revenue grew 17% to $148.1 million. Earnings per share were up 25% to $.85/share. And "same-unit revenue growth" was strong at 9.7%. I selected Packeteer for this blog on June 10, 2003 at $15.10. PKTR closed at $14.65 on 6/18/04 for a loss of $(.45) or (3.0)%. On April 22, 2004, PKTR announced 1st quarter 2004 results. Net revenues for the first quarter ended March 31, 2004, grew 28% to $21.5 million. Net income for the quarter was $3.4 million or $.10/diluted share compared with $2.1 million or $.07/diluted share...an increase of approximately 50%. On June 10, 2003, I posted Caremark Rx (CMX) on this blog at a price of $24.66. CMX closed on 6/18/04 at $33.10/share for a gain of $8.44 or 34.2%. On May 6, 2004, CMX announced 1st quarter results. During the quarter, net revenues came in at $3.0 billion, a 40% increase over the prior year's results. These results included $465.1 million in revenue from AdvancePCS, a recent acquisition. Net income came in at $84.2 million vs. $63.0 million the prior year, or $.29/diluted share vs. $.24/diluted share the prior year. This company appears to be continuing in its successful "track record". On June 11, 2003, I postede Lennar Homes (LEN) on the blog at $75.45. LEN split 2:1 on 1/21/04 making my effective pick price actually $37.73. LEN closed on 6/18/04 at $44.24 for a gain of $6.51/share or 17.3%. On June 15, 2004, LEN reported 2nd quarter 2004 results. For the quarter ended May 31, 2004, revenue came in at $2.3 billion, up 11%. Earnings per share came in at $1.22/share up 20% from the prior year. The 2004 estimates were also upped at that time to $5.50 from $5.30/share. More recently, on June 16, 2004, LEN reduced estimates for the upcoming quarter. They REDUCED estimated earnings for the third quarter, while at the same time upped estimates for the following quarter, the fourth quarter of the year. WebEx (WEBX) was posted on Stock Picks on 6/11/03 at a price of $14.41. WEBX closed on 6/18/04 at a price of $19.86, for a gain of $4.45 or 30.9%. Insofar as earnings are concerned, on April 20, 2004, WEBX announced 1st quarter 2004 results. Revenue came in at $56.3 million, a 35% increase over the first quarter 2003 results. Earnings came in at $.22/diluted share vs $.15/share the prior year. This company is doing just fine! On June 12, 2003, I posted Oshkosh Truck (OSK) on my blog at a price of $62.50. OSK split 2:1 in August, 2003, so my net adjusted pick price was actually $31.25. OSK closed on 6/18/04 at a price of $53.35 for a gain of $22.10 or 70.7%. On 4/27/04, OSK announced second quarter 2004 results. Sales during the quarter increased 14.3% from $453.4 million to $518.2 million in 2004. Net income increased 59.2% to $22.5 million or $.62/share, compared with $14.1 million or $.40/share last year. I posted Charles River Associates (CRAI) on the blog at $27.95/share on June 12, 2003. CRAI closed at $31.94/share on 6/18/04 for a gain of $3.99 or 14.3%. On 6/10/04, CRAI reported 2nd quarter 2004 results. Revenue increased 13.5% to $45.7 million from $40.2 million in the same quarter in 2003. Net income increased 42.7% to $4.0 million from $2.8 million the prior year. Hang in There....just one more to review! On June 13, 2003 I posted Lannett (LCI) on the blog at $21.53/share. LCI closed at $14.22 on 6/18/04 for a loss of $(7.31) or (34)%. On 4/27/04, LCI reported 3rd quarter 2004 results. Net sales increased from $11 million in 2003 to $16 million for the same quarter. However, diluted earnings per share were unchanged at $.16/share in the quarter in both years. So how did we do? Well, I had seven stocks with gains and two with losses for an average gain of 27.9%. Not too shabby indeed! Remember, past performance is NO GUARANTEE for future performance and please consult with your investment advisors for personalized investment help. Hello Friends! Thanks so much for stopping by! I am afraid that some of you are reading this through third party sources....sort of lifting the material to other websites. I guess I can live with that...but if you wish to visit my blog stop by at . Would love to have you continue visiting right here! Remember, I am an AMATEUR investor, so as always, I must insist that you do your own confirmatory research before relying on the material on this website and PLEASE consult with your own investment advisors to make sure that all investments discussed here are appropriate for you! Earlier today I sold a portion of my Starbucks stock at a 90% gain...thus I was able to add a position to the portfolio. I didn't waste any time :). 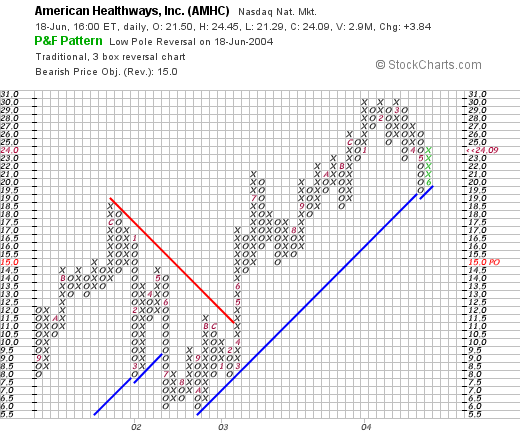 Scanning the lists of greatest % gainers I came across American Healthways (AMHC). AMHC closed at $24.11 today, up $3.86 or 19.06% on the day. According to the Yahoo Profile, AMHC "...provides specialized care enhancement and disease management services to individuals in all 50 states, the District of Columbia, Puerto Rico and Guam." Yesterday, after the close of trading, AMHC reported 3rd quarter 2004 results. Revenues for the quarter ended May 31, 2004, increased 56% to $65.4 million from $42.8 million the prior year. Earnings per diluted share jumped 57% to $.22/share from $.14/diluted share in 2003 same quarter. In addition, AMHC RAISED GUIDANCE for the rest of 2004. These are ALL great results. As I posted previously, after selling a little SBUX on a gain, I was looking for a new position, and DID buy some AMHC earlier today! If we examine the "5-Yr Restated" financials on Morningstar.com, we can see that revenue has grown nicely from $50.1 million in revenue in 1999 to $196.0 million in the traiiing twelve months. (With the latest quarter over $60 million, this company could have a revenue nearing $250 million for 2004). Earnings dipped to $.01/share in 2000, and since then have steadily increased to a recent $.56/share in 2003. Free cash flow, while not steadily growing, HAS stayed steadily positive with $6 million in 2001, and $11 million in 2003. The balance sheet appears adequate, with $29.3 million in cash and $45.1 million in other current assets, easily covering the $34.9 million in current liabilities, but not enough to cover the $59.5 million in long-term liabilities as well. How about valuation? Looking at "Key Statistics" on Yahoo, we can see that the market cap is a SMALL $784.47 million, the trailing p/e is a bit rich at 43.17, but with the fast growth rate the forward p/e is only 24.84 (fye 31-Aug-05). Thus, the PEG is downright cheap at 0.83. Yahoo reports 32.56 million shares outstanding with 28 million of them that float. Interestingly, as of 5/10/04, there were 7.61 million shares outstanding representing 27.18% of the float or 13,329 trading days. THAT is a LOT of short shares out there....and we MAY be in the midst of s SQUEEZE as the short sellers scramble to cover. There are no cash dividends reported on Yahoo....but the stock DID split 2:1 on 12/22/03. we can see that the stock has been trading lower between late 2002 and April, 2003, when it dropped from $18.50 down to about $6.00. Since then, the stock has been trading higher fairly steadily. So what do I think? I actually LIKE this company....so much that I BOUGHT some stock! The valuation is reasonable, they are growing their revenue and earnings rapidly....it just looked like a good idea to me! Hello Friends! Well you KNOW the old story. I HATE to have a nickel in my pocket without SPENDING it! So, scanning the list of high % gainers today, I came across American Healthways, Inc., and a few moments ago, purchased 300 shares at $23.50/share. Just keeping you posted. AMHC is currently trading at $23.65, bid $23.66, and asked $23.70. Hello Friends! Well, unfortunately I do not have much of Starbucks (SBUX), but it DID hit a sell point today. Earlier today I sold 15 shares of my 60 share position at $43.92. I had purchased these shares on 1/24/03 for $22.81/share, so this was a gain of $21.11/share or 92.5%. I have already sold 25 shares at $28.47 on 9/8/03, and another 15 shares at $35.16...so this was my THIRD sale of SBUX...and I was aiming for about a 90% gain to sell...and there it was. My next sell point will either be at 45% gain to sell out the remaining shares....or at about a 120% gain...whereby I should be selling another 1/4 of the holdings....even if it IS a tiny position now! Well and you KNOW what that means....that means I have another NICKEL BURNING a hole in my pocket...lol...so I can start LOOKING for another position....am sitting at 21 positions now...so I have room for up to 25 in my portfolio. I recently had some correspondence from Greg who is working on a blog about investing that is quite informative! I have listed a link to thegoldencoast.comon the side of this blog and encourage you to visit! Hello Friends! Well, I came CLOSE to unloading that IGT stock this morning. I wasn't paying much attention during the day to the market yesterday and didn't see that big sell-off....well the stock went into the RED and since I have already sold a portion at a gain, well in my system that means I need to unload it before I lose any money on the remaining shares...but the stock rebounded and is trading at $34.65, up $1.20 on the day...so now above my cost. Anyhow, I sure appreciate your visit to my blog. If you have any questions or comments, please feel free to email me at bobsadviceforstocks@lycos.com and I will try to get back to you ASAP...usually with an entry on the blog itself. Remember, I am an AMATEUR investor, so do investigations on the stocks discussed yourself, and PLEASE consult with an investment advisor prior to making any decisions based on information on this website. Greg Manning Auctions (GMAI) hit the lists today with a huge move of $3.50 to $15.70 representing a 28.69% gain on the day! I do NOT own any shares of this stock (unfortunately) nor do I own any options or leveraged positions. GMAI raised estimates today for its full year sales and earnings. They announced that they expect earnings for fiscal 2004 to range from $22 to $23 million up from an earlier forecast of $14 to $15 million. Revenue estimates jumped to $205 to $210 million, up from estimates of $170 to $175 million. It should be noted, that much of this growth is related to 11 acquisitions made over the past 10 months...but they are certainly doing a good job in managing these imho. According to the GMAI website, Greg Manning Auctions "...is a global collectibles merchant and aution house network, with operations in North America, Europe, Asia, and on the internet." 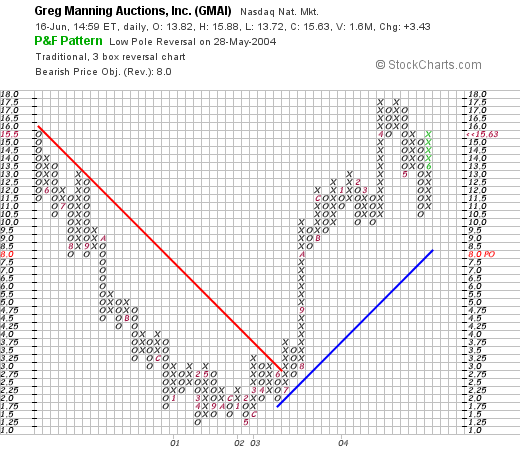 On May 6, 2004, Greg Manning Auctions announced 3rd quarter 2004 results. "Aggregate" sales rose 158% to $80.9 million from $31.3 million the prior year. Revenue rose 143% to $64.5 million from $26.6 million the prior year. Earnings per share were $.23/diluted share vs. $.16/diluted share in the prior year's same quarter. Looking at Morningstar.com "5-Yr Restated" financials we can see that revenue has grown from $77 million in 1999 to $144 million in the trailing twelve months. Earnings have been a bit erratic, dropping from $.11/share in 1999 to a loss of $(1.58)/share in 2001, but improving steadily since then to $.60/share in the trailing twelve months. Free cash flow has been negligible with $0 in 2001, $(1) million in 2002, $(1) million in 2003 and $0 in the trailing twelve months. I would like to see this improve as the company grows...but certainly, they are not at this time burning up their available cash resources. Balance sheet wise, they have $9.3 million in cash and $60.3 million in other current assets vs. $29.2 million in current liabilities and only $5.8 million in long-term liabilities. This is heavily biased in favor of current assets...so it looks good to me. How about valuation? If we review "Key Statistics" on Yahoo finance, we can see that the current market cap is only $418.26 million. The trailing p/e isn't bad at 23.25, but NO forward p/e is reported. Along with this, there is NO PEG reported....so it appears analysts do not have a good handle on the five year estimated growth....however, with the explosive current upward revisions, and the low current p/e, I suspect the PEG may very well be well under 1.0...but that is just MY opinion. Yahoo reports 26.69 million shares outstanding with 12.30 million of them that float. Of these, 5.72% of them are out short as of 5/10/04 representing 3.043 trading days of volume. No cash dividend is reported and no stock split is noted on Yahoo either. Looking at a "Point & Figure" chart from stockcharts.com, we can see that this stock really was trading UNDER a resistance level in a downward direction throught much of 2000 and 2001, and then in July, 2003, broke out of a resistance level of $3.25 and has been trading strongly higher above its support level since then. Looks fine to me! So what do I think? I am a bit concerned about the large volume of acquisitions that is driving the numbers...I am not sure about the internal growth...one could say the "same store sales growth" if this was a retail stock. However, the growth is still coming down to the bottom line...they are managing their acquisitions well and growing the company, the earnings look great, the revenue growth is fantastic, the free cash flow is mediocre at best...but the balance sheet looks nice as does the technicals and valuation....so overall this is a pretty stock if perhaps a touch speculative imho. Unfortunately, I do NOT have any cash to spend...am still waiting on a sale of a current position at a gain....at least a portion of a stock lol...so you know THAT song! Thanks again for stopping by! Please feel free to leave comments right here or email me at bobsadviceforstocks@lycos.com if you have any comments or questions. Hello friends! Thanks again for stopping by. The market was acting a little healthier today, surviving Greenspan's testimony, and closing with both the NASDAQ and DOW making gains. If you have any questions or comments on this blog, please feel free to email me at bobsadviceforstocks@lycos.com Remember that I am an amateur investor, so my commentary should be taken with a grain of salt, you should do your own investigation on all investments discussed on this website and PLEASE consult with your financial advisors before taking any action. Speaking of the market, IGT took a hit closing down about 10% and pushing my position into the "red". Since I have already sold a portion of this stock at a gain, I shall be watching this stock closely tomorrow and if it isn't rebounding quickly, it shall be sold from the trading portfolio. 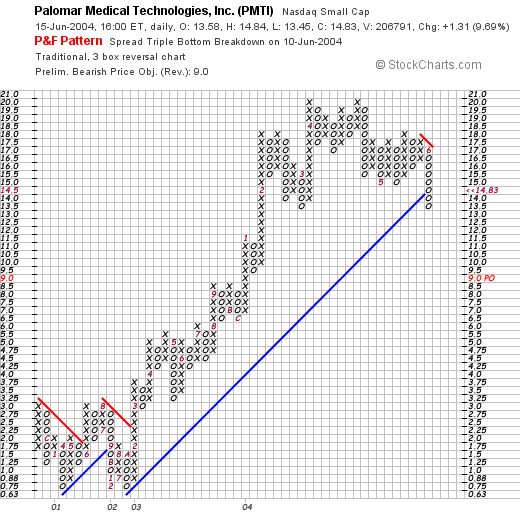 Palomar Medical Technologies (PMTI) had a nice day today, closing at $14.83, up $1.31 or 9.69% on the day. Full disclosure, I DO have some shares of Palomar in a managed account that I do not advise regarding trades. According to the Yahoo profile, Palomar "...is a researcher and developer of light-based systems for hair removal and other cosmetic procedures." On April 29, 2004, PMTI reported 1st quarter 2004 results. Revenues for the quarter ended March 31, 2004, were $10.8 million up from $6.8 million in the first quarter of the prior year. Net income was $1.2 million, or $.07/diluted share, compared to net in come of $358,000 or $.03/share the prior year. These are nice results! What about longer term? Revenue growth has been erratic over the last ten years; however, over the past five years, the company has been growing fairly steadily as it developed its hair-removal technology. Reviewing the "5-Yr Restated" financials on Morningstar.com, we can see that revenue actually dipped from 1999 at $24.3 million to $13.2 million in 2000, but has increased steadily since then with $34.8 million in revenue reported in 2003. Earnings, which WERE at $2.39/share in 1999, dropped to a loss of $(.90) in 2000, but have been also increasing steadily since. Free cash flow, which came in at $(9) million in 2001, $(1) million in 2002, turned positive to the tune of $1 million in 2003. What about the balance sheet? Per Morningstar.com this appears quite solid imho. They report $10.6 million in cash, more than enough to cover the current liabilities of $7.3 million. NO long-term liabilities are reported. In addition PMTI has another $10.4 million in other current assets. How about valuation? Looking at Yahoo "Key Statistics", we can see that this is a SMALL cap stock with a market cap of $232.37 million. The trailing p/e is steep at 59.08 but a forward p/e (fye 31-Dec-05) comes in at 26.02. With the rapid growth in earnings estimated, the PEG comes in at a moderate 1.41. Price/sales, however, is also rich at 5.46. Yahoo reports 15.67 million shares outstanding with 12.60 million of them that float. Of these, there are 584,000 shares out short as of 5/10/04, representing 2.413 trading days or 4.64% of the float. This appears to be a moderate amount of short interest...I use 3.0 days as a "cut-off" for significance. No cash dividend is reported, PMTI had a REVERSE 1:7 split in May, 1999. No other stock splits are reported on Yahoo. Overall, the stock broke through a resistance level in February, 2003, and has traded higher from $2.25/share to the current level. In the last couple of days, the stock DID break through a support level at about $14.50. However, with the recent Move to $14.83, the stock is now trading back above its support line...so while of some concern, the stock doesn't yet appear to have broken down. Hello Friends! Thanks again for stopping by. Sorry about the lapse of entries last week. You KNOW I am just an AMATEUR investor....and well...let me just point out that I am a bit of an AMATEUR blogger as well! It is amazing how one starts thinking of that invisible blog audience out there that is WAITING for your entry...or maybe I am just doing some wishful thinking. Anyhow, please remember to do your own investigation of all stocks discussed on this blog and please consult with your investment advisors regarding the suitability of any investment discussed here. Now that I am back in business on this blog, I was scanning through the large percentage gainers today and came across Curtiss-Wright (CW). I do not own any shares nor do I have any leveraged or option positions in this company. CW had a nice day today, in an otherwise lackluster market, closed at $49.46, up $2.34 or 4.97% on the day. According to the Yahoo profile on CW, they are "...engaged in the design and manufacture of motion control, metal treatment and flow control products for the aerospace, metal working and other industries." On April 29, 2004, CW reported 1st quarter 2004 results. Net sales increased 19% to $214.9 million from $179.9 milllion in 2003. Net earnings were up 11% to $15.6 million or $.74/diluted share. Looking at Morningstar.com "5-Yr Restated" financials, we can see that revenue has grown steadily from $293.3 million in 1999 to $746.1 million in 2003. Earnings have grown, somewhat less consistently, from $1.91/share to $2.50/share in 2003. Free cash flow has been positive with $42 million in 2001, increasing to $50 million in 2003. The balance sheet looks reasonable if less than spectacular with $98.7 million in cash and $275.9 million in other current assets, more than enough to cover all of the current liabilities of $135.9 million and enough to make a dent in the long-term liabilities of $358.9 million. What about valuation? Looking at "Key Statistics" from Yahoo.com, we can see that this is a mid-cap investment with a market cap of $1.04 billion. The trailing p/e isn't bad at 19.36 and the forward p/e is even nicer at 14.63. I like the PEG which is quite reasonable at 1.07 and the price/sales is also quite nice at 1.27. Yahoo reports 20.99 million shares outstanding with 18.50 million of them that float. Currently there are 955,000 shares out short as of 5/10/04 representing 5.16% of the float, and due to the relatively low trading volume of this stock, get this....22.738 trading days! Even though there aren't a lot of shares out short THAT is a lot of buying pressure on this stock if the stock should rise...as it did today...and possibly contribute to a bit of a "squeeze". The company DOES pay a dividend of $.36/share yielding 0.76%. They recently split their shares 2:1 in December, 2003. Well how do the "Technicals" look? 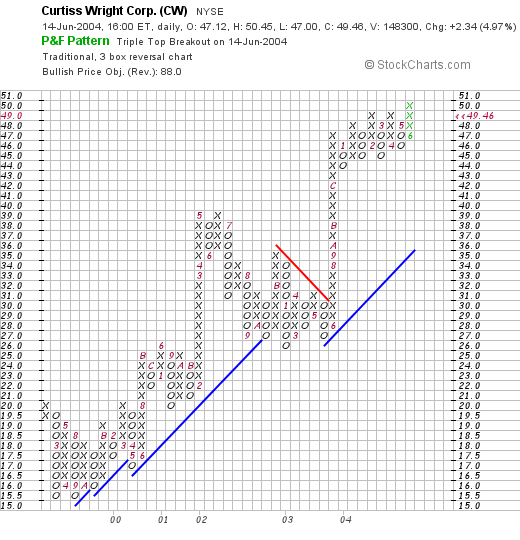 Looking at a "Point & Figure" chart from Stockcharts.com, a website that I HIGHLY recommend you visit and utilize....the graph simply looks beautiful...if not a little extended. The stock has been trading higher between 1999 and 2003 and then ran into a bit of resistance during 2003, finally breaking out in June 2003 and not looking back! Well what do I think? The recent earnings are nice, the past revenue growth has been terrific, the free cash flow is excellent, the stock pays a dividend, the balance sheet is reasonable, the valuation is great with a PEG just over 1.0, and a Price/Sales just over 1.2, and the recent stock chart looks marvelous. Well, if I HAD some money, lol, I would probably buy a little of this stock. Well you know, I am waiting to SELL some of my existing positions at a GAIN before adding another position...but I guess I can dream about it :). Hello Friends! Thanks so much for stopping by. I was away from my computer this past week so I haven't been making many entries here. Every once in a while I "get a life." Before I go any further, let me please remind you that I am an AMATEUR investor so PLEASE check with your professional investment advisors regarding the appropriateness of investments discussed on this website for your particular needs. On June 2, 2003, I posted Coach (COH) on Bob's Advice at a price of $51.53. COH split 2:1 in October, 2003, making my effective selection price $25.77. I also own COH in my Current Trading Portfolio. COH closed on 6/10/04 at $45.70 for a gain of $19.93 or 77.3%. On April 20, 2004, COH announced 3rd quarter 2004 results. For the quarter ended March 27, 2004, COH reported net sales of $313.1 million, a 42% increase over the $220.4 million reported the prior year. Net income improved 83% to $58.3 million from $31.9 million the prior year. Earnings per share were up 76% to $.30/share compared to $.17/share the previous year. These are all great results. The second stock listed that week was Affiliated Computer Services (ACS) which was posted on Stock Picks Bob's Advice on June 2, 2003, at a price of $49.18. ACS closed at $49.75 on 6/10/04, for a gain of $.57 or 1.2%. On April 20, 2004, ACS announced 3rd quarter 2004 results. Excluding acquisitions, revenue grew to $1.01 billion. "Internal" revenue growth was 14%, the remaining growth was due to acquisitions. Excluding one-time events, earnings per share increased 18% to $.67/share compared to $.57/share the prior year. I am not real excited about all of these exclusions, but the company appears to be doing satisfactorily. My third selection that week was ExpressJet (XJT) which was selected for Stock Picks on June 2, 2003 at a price of $12.60. XJT closed at $11.78 on 6/10/04 for a loss of $(.82) or (6.5)%. On April 15, 2004, XJT announced 1st quarter 2004 results. Operating revenue increased 19% to $364.0 million, up from $306.6 million in the first quarter of 2003. Net income came in at $28.7 million or $.53/diluted share, a 33% increase over 2003 results. These results are certainly fine. The Airline Stocks have been under pressure recently due to increased energy costs with the spike in petroleum prices. However, XJT appears to be doing fine in their underlying business as demonstrated by the recent "May, 2004 Performance" report. On June 3, 2003, I posted Walgreen (WAG) on the blog at a price of $32.17. WAG closed on 6/10/04 at a price of $34.62 for a gain of $2.45 or 7.6%. On June 3, 2003, I posted School Specialty (SCHS) on Stock Picks at a price of $25.45. SCHS closed on 6/10/04 at $35.88 for a gain of $10.43 or 41%. On June 8, 2004, SCHS announced 4th quarter 2004 results. For the quarter ended April 24, 2004, revenue rose 12% to $161.4 million, boosted by acquisitions. Net LOSS however, WIDENED to $(6.1) million or $(.32)/share compared to $(4.9) million or $(.26)/share the prior year. Even though this seems bad to me, on the same day SCHS announced 2005 outlook which projected earnings of $2.30 to $2.50/share a 19 to 26% increase over 2004 results and consistent with analysts expectations. Overall the street appears to be satisfied with these results. Personally, I would like to see narrowing losses and improving earnings each and every quarter! June 3, 2003, also found me picking Select Medical (SEM) for Stock Picks at a price of $22.10. SEM closed at $12.92 on 6/10/04 for a loss of $(9.18) or (41.5)%. On April 27, 2004, SEM announced 1st quarter 2004 results. Net operating revenues for the quarter ended March 31, 2004, increased 35.1% to $422.0 million compared to $312.3 million the prior year. Net income increased 104.6% to $29.6 million compared to $14.5 million the prior year. On a fully diluted basis, this was $.27/share compared to $.15/share the prior year. These were great results but then WHY did SEM drop in price this last year? This was explained by Herb Greenberg on CBS Marketwatch who pointed out that the fastest growing part of its business, operating long-term care hospitals inside existing acute care hospitals faced a "potential crackdown by regulators." The stock has dropped since this became known. Also on June 3, 2003, I posted United Financial Mortgage (UFM) on Stock Picks at $8.05/share. UFM closed at $5.20 on 6/10/04 for a loss of $(2.85) or (56.4)%. On March 9, 2004, UFM reported 3rd quarter 2004 results. Revenues decreased $3.2 million to $12.7 million from $15.9 million for the same quarter the prior year. Net income was $638,000, or $.12/diluted share compared to $1.5 million or $.39/share the prior year. These appear to be LOUSY results, and thus the LOUSY stock performance in my opinion. HANG IN THERE! SEVEN DOWN AND SIX TO GO!!! On June 4, 2003, I posted E-Loan (EELN) on Stock Picks at a price of $5.06. EELN closed at $2.76 on 6/10/04 for a loss of $(2.30) or (45.5)%. On April 29, 2004, EELN reported 1st quarter 2004 results. Total revenue came in at $32.02 million down from $36.2 million the prior year in "Total Revenue". Diluted eps came in at $(.02) vs a profit of $.10 the prior year. These are NOT encouraging results in my opinion...and thus would not be continuing to plug this stock! On June 5, 2003, I posted CarMax (KMX) on Stock Picks at a price of $28.65. KMX closed at $22.50 on 6/10/04 for a loss of $(6.15) or (21.5)%. On March 30, 2004, KMX reported 4th quarter 2004 results. Revenue for the quarter rose to $1.12 billion from $946.6 million the prior year. Net income increased 18% to $22.5 million or $.21/share up from $19.1 million or $.18/share the prior year. These results and guidance for the next quarter were UNDER analysts expectations and the stock subsequently declined. In fact, on June 4, 2004, just a few days ago KMX reported 1st quarter same store sales results actually DECLINED 3%. For any retail venture, declining same store sales results are a NEGATIVE for any investor. On June 5, 2003, I wrote up Mothers Work (MWRK) on Stock Picks Bob's Advice at a price of $25.55. MWRK closed at $23.22 on 6/10/04 for a loss of $(2.33) or (9.1)%. On June 3, 2004, MWRK announced May, 2004, same store sales results. Blaming a loss of a Saturday in the month, they related that stores open at least a year had sales that FELL 3%. Not good. The latest quarterly report was announced on April 27, 2004. For the quarter ended March 31, 2004, net sales increased 13.0% to $125.8 million with comparable store sales increasing 0.2% for the quarter. Net income came in at $.4 million or $.08/diluted share vs $.3 million or $.06/diluted share last year. These at best appear to be lukewarm results. On June 5, 2003, I posted American Pharmaceutical Partners (APPX) on Stock Picks at $37.39. APPX split 3:2 so our actual selection price was $24.93. APPX closed on 6/10/04 at $31.01 for a gain of $6.08 or 24.4%. On April 21, 2004, APPX announced 1st quarter 2004 results. Sales increased 10% to $89.2 million. However, net income came in at $11.8 million or $.16/diluted share vs. $17.1 million or $.23/diluted share in 2003. However, they emphasized anticipated excess of 20% in growth of sales in 2004. Overall, the street was satisfied with these results. Personally, I would prefer to see continued earnings growth ALONG with the revenue growth. Also on June 5, 2003, I posted Christopher & Banks (CBK) on Stock Picks at $33.45. CBK split 3:2 on 8/28/03 for a net effective pick price of $22.30. CBK closed on 6/10/04 at $17.26 for a loss of $(5.04) or (22.6)%. On June 3, 2004, CBK announced May Same store sales which fell 6% attributed to "weak sweater sales". They also announced REDUCED expectations for the first quarter of between $.26 and $.27/share. In April, they HAD announced expectations of $.28 to $.30/share. The street did NOT like this news...for good reason! FINALLY (sigh), on June 6, 2003, I posted Cardinal Health (CAH) on Stock Picks at $64.17. CAH closed at $68.84 on 6/10/04 for a gain of $4.67 or 7.3%. On April 22, 2004, CAH announced 3rd quarter results. Revenue rose 14% to $14.6 billion and earnings per diluted share improved 15% to $.98/share. These were good results! In summary, my 13 selections experienced a net LOSS of (3.41)% for the year period. I was affected by declining retail sales for the specialty retailers listed, climbing petroleum costs, and climbing interest rates. This shows that this method is not infallible, cannot be followed by blindly holding these equities, and must be actively managed by sales of stocks that decline! I hope this was helpful for you to review our past picks! The last two reviews showed strong gains in the 30% range...but this week was ANYTHING BUT strong!